BEAVERTON, Ore.--(BUSINESS WIRE)--Three years ago Nike launched Air Max Day, a response to global fervor for one of the most beloved footwear platforms of all time. Today, Nike begins a journey to this year’s Air Max Day, a worldwide celebration of Air highlighted by the long-awaited release of Nike Air VaporMax. Nike will celebrate Air Max Day on March 26 by marking the 30th anniversary of the Air Max 1, the shoe that pushed footwear to unprecedented heights with new cushioning style and performance features. Throughout March, Nike will release a mix of retros, remixes and innovations. This fresh line-up of Air, including the highly anticipated Nike Air VaporMax, represents the latest chapter of Nike’s longstanding commitment to serve athletes. The new product delivers on what consumers want, by transforming the athletic footwear landscape with the most powerful and resilient underfoot platform yet. “The Nike Air VaporMax is a tremendous example of what happens when we harness the combined insights of our design collective. When designers embrace the technology, and push its potential, we have a boundless future. Just as the Air allows us to run forever, it allows our imaginations to ponder near limitless permutations,” said John Hoke, Vice President, Global Design for Nike. Air has been an integral part of Nike since it was first introduced in the 1979 Air Tailwind. In the decades since, it’s drawn strong consumer devotion; a massive and passionate consumer fan base that has driven design and depth of product. Nike Air has disrupted the industry with color, materials and the Air platform itself. For the first eight years it was hidden – felt rather than seen. Then, in 1987, it became visible with Air Max. It soon evolved, spreading from running to basketball to training and tennis, all while becoming a coveted lifestyle product across the globe. The line quickly endeared itself to consumers because of its responsiveness to movement, its durability, and its groundbreaking and beautiful design. Through it all, Nike Air technology has driven the industry forward, and continues to define what’s possible with underfoot cushioning. With Nike Air VaporMax, athletes get closer to the sensation of Air than ever, with layers removed between the foot and the Air platform itself. 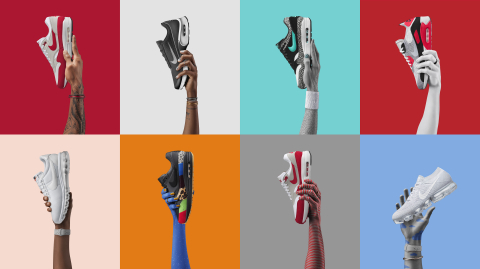 This innovation and dedication has created a product that consumers are passionate about, and demand year after year – and the Nike Air Max delivers yet again. In 2016, by popular vote, consumers “voted back” the Nike Air Max 1 atmos Elephant, which makes its return as part of the Air product line-up. The Women’s Nike Air Max Jewell is the second-ever women’s Air Max shoe. Nike Air Max 90 Ultra Flyknit delivers on what consumers expect, and ask for: Flyknit, a high-performing, breathable, supportive upper; and Air, responsive, agile, strong, beautiful and light. The unveil will be available at retailers globally. To learn more, please visit the Nike+ SNKRS App. NIKE, Inc., (NYSE:NKE) based near Beaverton, Oregon, is the world's leading designer, marketer and distributor of authentic athletic footwear, apparel, equipment and accessories for a wide variety of sports and fitness activities. Wholly owned NIKE, Inc. subsidiaries include Converse Inc., which designs, markets and distributes athletic lifestyle footwear, apparel and accessories; and Hurley International LLC, which designs, markets and distributes surf and youth lifestyle footwear, apparel and accessories. For more information, Nike’s earnings releases and other financial information are available at http://investors.nike.com. Individuals can also visit http://news.nike.com/ and follow @Nike. Nike will celebrate Air Max Day, a worldwide celebration of Air, on March 26 by highlighting the long-awaited release of Nike Air VaporMax.